If you were given the opportunity to ride in a helicopter would you go? Nope. To be fair, I’ve done this so I already know the nausea inducing motion involved. Bonus answer: I wouldn’t jump out of a plane either. I’m messing around with my diet right now so almost anything’s fair game. Over the years I’ve eaten a lot of red meat but I’m trying to cut that back. I’d say I get most of my protein from eggs, chicken, and nuts. Definitely awake before noon. People keep talking about how beautiful the sunrise is…it’s not that I think they’re lying, it’s just that in my experience my exhaustion and typically freezing fingers make the entire thing an unpleasant outing. 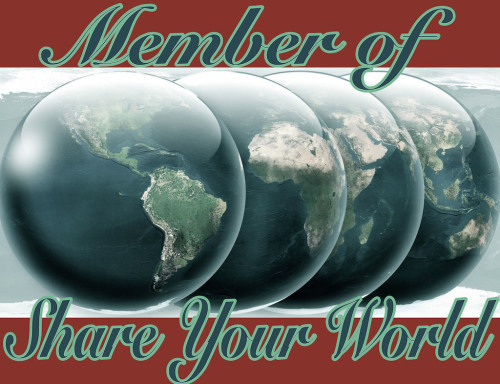 Cee’s Share Your World comes ’round on Monday’s. Check out her blog here. Next Next post: Where’d my funny go? Why “freezing fingers” at dawn? The one protein I won’t eat is chicken. That’s why I still have beef from time to time. Maybe only a couple times of week or less. Thanks for sharing. Eggs for me, too. Eggs and greens are my main protein sources. Ah, hubby loves greens. (Wait, do you mean the “southern cooked until they’re a soggy mess” greens?) Alas, I can’t even stand the smell of them. I do enjoy helicopter rides and I have jumped out of a plane – 3 actually. I was just learning to sky dive and found out I was pregnant after the third jump, had to stop because doctors frown on sky diving when you are knocked up! To be fair I don’t blame the pilot, it was all my hubby’s fault! Thanks! This one spoke to me, too.